3 kW solid state power supply, remote heat station and a specially-designed inductor (coil). A four-turn helical inductor with a kidney shape was used to provide uniform heat for this application. Initial tests were conducted to establish a heating profile and time-to-temperature. The turbine blade was placed inside the coil and power was applied until the top 0.25” of the blade reached 1800°F. An optical pyrometer was used to measure the temperature of the part. The desired temperature was reached in 5 minutes. 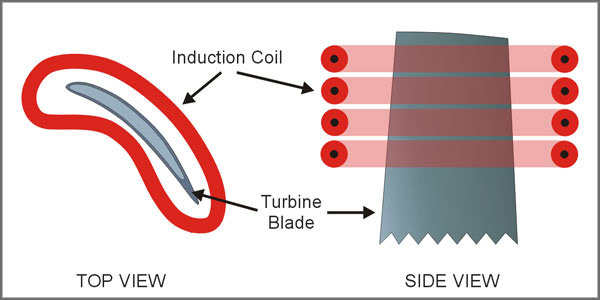 Consistent and uniform results were obtained with the 3 kW power supply and inductor; ±3°F temperature uniformity was achieved from the leading edge of the blade to the trailing edge. A 5 kW power supply could be used to further reduce the heating cycle.